Murcia…somewhere between Valencia and Andalucía. Murcia is a little-known corner of Spain tucked away between Comunitat Valenciana and Andalucía, southeast of Castilla La Mancha, on the Mediterranean. It’s small but quaint and offers a lot to see and do. My first time in Murcia was a quick day trip from Alicante when I was living in Valencia. Valencia was the hardest year I’ve had in relations to money, and I wanted to go somewhere new that was close by. I had been to Alicante but wanted to go back, and I combined that with going to Murcia on the same trip. I saw the capital city, which is the 7th largest city in Spain. The Cathedral is the most impressive thing that I remember from that too short visit. It was the 15th autonomous community I had been to, and at that period in my life, I was still ticking off the comunidades off a to-do list instead of taking the time to truly get to know and experience them like I do now. Never fear, in 2012 I got a chance to return to Murcia for an extended 10-day visit while working at a summer camp with my school close to La Manga on Mar Menor. Mar Menor is actually a big lagoon with perhaps the warmest water in Spain (it’s known as La Costa Cálida in Spanish) separated from the Mediterranean by a narrow strip of land known as La Manga. I freaked out at the number of jellyfish that summer (I have a fear of them), but I enjoyed being on the beach for 10 days and exploring the area of Mar Menor as much as possible. I’ll never forget how I arranged for my campers to visit an ice cream shoppe with a Spanish-British owner so the students could practice their English, then when I went, only the Spanish worker who didn’t speak English was employed. I get an A for effort, right? Also, the camp started out when Spain won the 2012 Eurocup! Why am I always working at camps when Spain whens fútbol cups? There are a few more places I still have yet to visit in Murcia, most specifically Cartagena. The comunidad autonoma is one of the few that is a single-province comunidad after Albacete was made part of Castilla La Mancha in 1980. (The other single-province comunidades are Asturias, Illes Baleares, La Rioja, Madrid, Navarra,and Cantabria.) The capital city has a population of 443,000 habitants, making it bigger than Bilbao. It’s one of the places that keeps itself out of the news, except for that earthquake which hit Lorca in 2011. La Iglesia Catedral de Santa María en Murcia, home of eternal resting place of Alfonso X el Sabio (the Wise), is one of the most famous monuments in Murcia. Construction began in the 14th century but wasn’t finished until the 1700s, which means it boasts a variety of styles including Gothic and Baroque. The 90 metre/300-foot tall bell tower took over 200 years to complete. After a flood took out the old bridge in 1701, Murcia had to rebuild the bridge that was the starting point to the road to Cartegena and crossed the Río Segura. The bridge was finished in 1742 and is the oldest permanent bridge in Murica today, having survived many more floods than it’s predecessor. 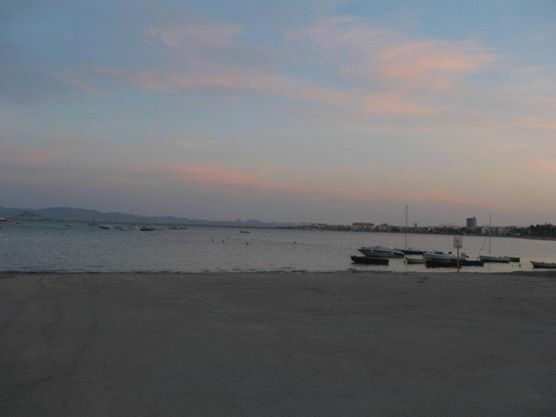 The saltiest lagoon in Europe, Mar Menor (the Small Sea) is a lagoon separated by a very narrow strip of land called “La Manga”. It attracts tourists year round. The water is never deeper than 7 metres (a little over 21 feet or…about 7 yards) which makes it perfect for water sports. Bring your sunscreen. Located only 4 kilometres (2.4 miles) from Murcia capital, Monteagudo is formed by three villages and is home of a castle with a huge statue of Jesus at the top that can be seen for kilometres around. I want to take the time to visit and hike to the statue of Jesus. It may not be Christ the Redeemer in Rio, but it still is pretty impressive. Cartagena, the second largest city in Murcia and one of the largest cities in all of Spain not to be a province capital with 219,000 habitants, is full of history and an important naval port. It has one of the most important Roman theatres in Spain (famously seen in Alex de la Iglesia’s La chispa de la vida). It’s at the top of my bucket list in Spain due to all the Roman Ruins. Too bad I’m at the opposite end of the peninsula! Lorca, a city of 92,000 habitants, made the news in 2011 when it was the epicenter of an earthquake that killed 9 people and destroyed a bell tower. It was only a 5.1, but the quake was so close to the surface it felt like an 8.0 on the Richter scale. The city was an important battle place in the wars between the former Kingdoms of Murcia and Granada. It still boasts a castle, although there was some damage from the 2011 quake. Moratalla, a town of nearly 10,000 people, is the home of an important Castle, the Castillo Fortaleza. It’s also the home of the Arab castle in the Benizar neighbourhood and several churches and hiking. Looking at all this information, I see that I have a lot waiting for me for whenever the next trip to Murcia will be.